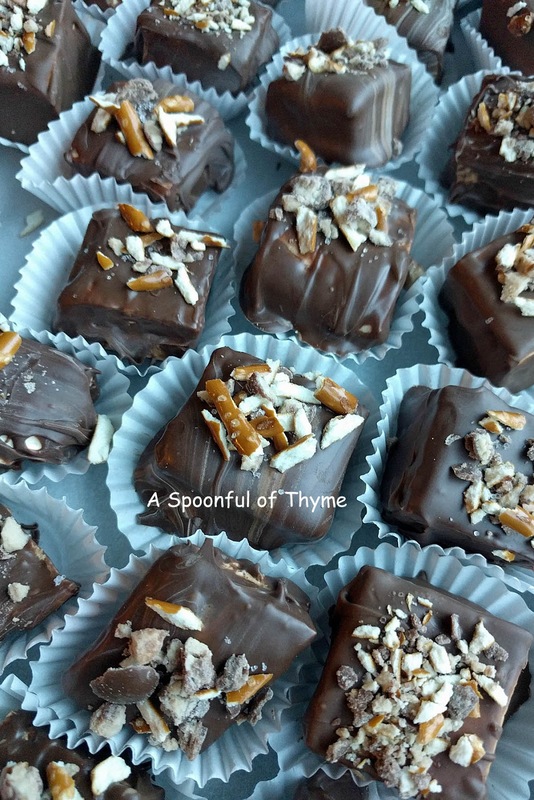 A Spoonful of Thyme: Chocolate Coated Beer Marshmallows...for your Valentine! Chocolate Coated Beer Marshmallows...for your Valentine! Chocolate and beer...a nice chocolatey stouty beer! Doesn't that sound like a nice combination? You are right, it is amazing! Making marshmallows sounded sticky to me. I wasn't certain about working with it but on this adventure, I was the sidekick....so, no worries. My SIL was the chef in charge. He had been participating in a baking competition at work...yes, there are teams that find time to do something totally different from their jobs! Anyway, he had won level one and was moving to level two. These little chocolatey guys were certain to be a Level 2 winner! Did I mention that there is a garnish? Yep, a crushed pretzel garnish..and, that was the sidekick's role....crush pretzels. 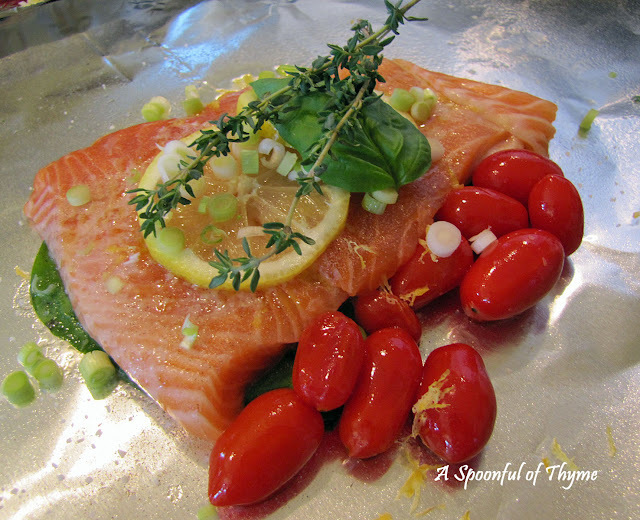 Sprinkle when requested, and add a sprinkle of sea salt! This is a recipe that takes time. The beer should flatten overnight. The marshmallows must cure in the refrigerator 10 to 12 hours or overnight. Just a note so that you allow yourself the needed time. The best beginning is starting the night before. Open the bottle of beer and let it sit overnight. If you forgot...pour the beer into a bowl. Whisk to release as much of the CO2 (carbon dioxide) as possible. Line an 8 X 8 inch baking dish or an 8.5 X 4.5 loaf pan with parchment paper and then spray with nonstick spray. Tape the edges of the paper to the sides of the pan. This keeps the paper in place as you spoon in the mixture. Or, spray your baking pan with nonstick spray. Sprinkle the gelatin in the bowl of a stand mixer. Mix the flattened beer and vanilla together. Pour the mixture over the gelatin. Allow the mixture to stand for three to five minutes. Whisk until no lumps remain. Combine the flattened beer, corn syrup, sugar, and salt in a 4-quart saucepan or larger. (We opted for the larger pan to avoid the overflow of any unforeseen excessive bubbling!) Attach a candy thermometer to the side. Turn the heat to medium high. Bring the sugar mixture to a boil. As the syrup heats it will foam up to the top of the pan. Keep watch! When the mixture is between 225° F. and 230° F., let it bubble for another 5 minutes and then remove from the heat. Ideally the syrup should reach 240° - 250° F, but you may have trouble getting an accurate reading due to the foam. If your syrup starts to climb to 250° F., remove the pan from the heat. With the mixer on low speed, carefully pour the hot syrup mixture down the side of the bowl into the gelatin bloom. 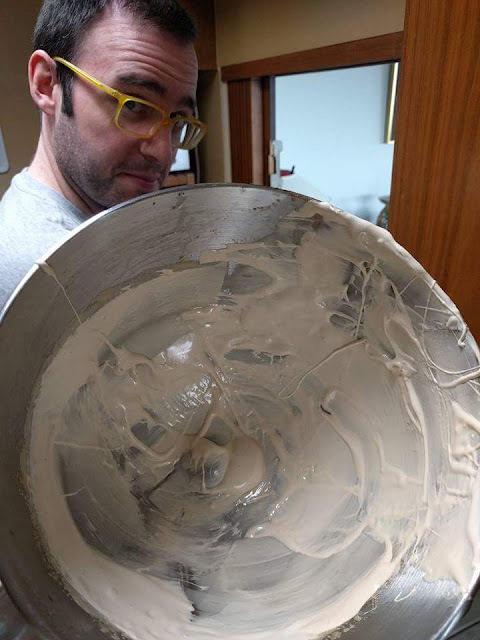 Turn the mixer to high and whip for 8-10 minutes, until it is very thick and looks like glossy meringue. Pour the marshmallow into the baking pan or loaf pan. Let it cure, uncovered, for 10-12 hours or overnight. When the marshmallows are cured, rub the top with a little powdered sugar. Turn the marshmallows onto a cutting board. Rub additional powdered sugar on the top. Cut the marshmallows into about 24 squares of equal size. The number depends on the size of square you desire. 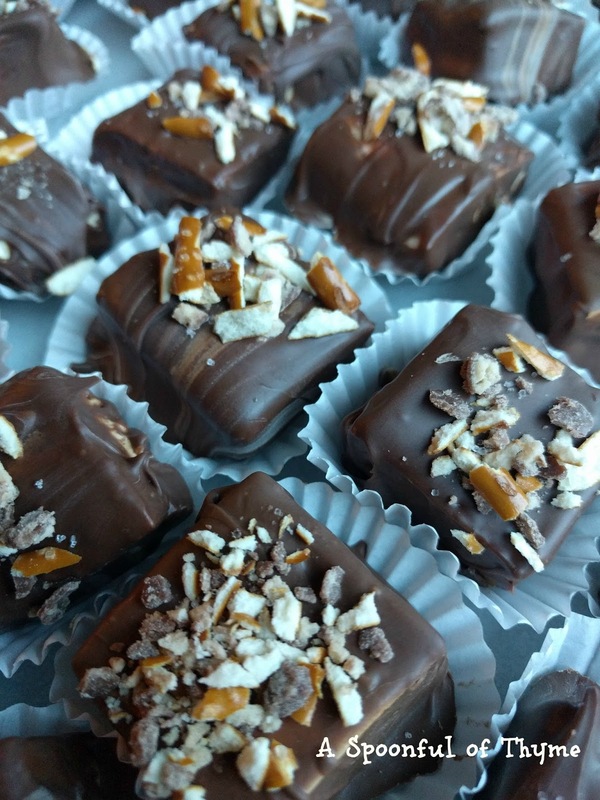 Melt the chocolate over a double-boiler or in 30-second intervals on HIGH in the microwave, stirring between each interval until the chocolate is melted. Should the chocolate be too thick, whisk in the canola oil a teaspoon at a time until the chocolate is thin enough to coat the marshmallows. Coat the marshmallows entirely by using a fork to lower the marshmallow into the chocolate and using a chopstick to turn the marshmallows in the chocolate. Lift the marshmallows out and set them on wax paper. Quickly sprinkle the tops of the marshmallows with crushed pretzels and a tiny bit of sea salt before they dry. Marshmallows will keep in a covered container for several weeks. NOTE: This is a recipe that takes time. The beer should flatten overnight. The marshmallows must cure in the refrigerator 10 to 12 hours or overnight. Just a note so that you allow yourself the needed time. I enjoy cooking with my SIL. He rocks! I am sharing today at Full Plate Thursday hosted by Miz Helen's Country Cottage. great final pic of SiL!!!!!! This is an amazing and creative combination! I’m reeeaaally not a fan of beer. Do you think I can substitute root beer for the beer? The marshmallows probably won’t be white but I would rather that than the taste of beer. What a very special treat! Happy Valentine Day and thanks so much for sharing your awesome talent with us at Full Plate Thursday! I don't know how I missed this post back in February, but I am definitely going to make these! I am not a drinker of beer, but I love to cook with it because it tends to make everything better. 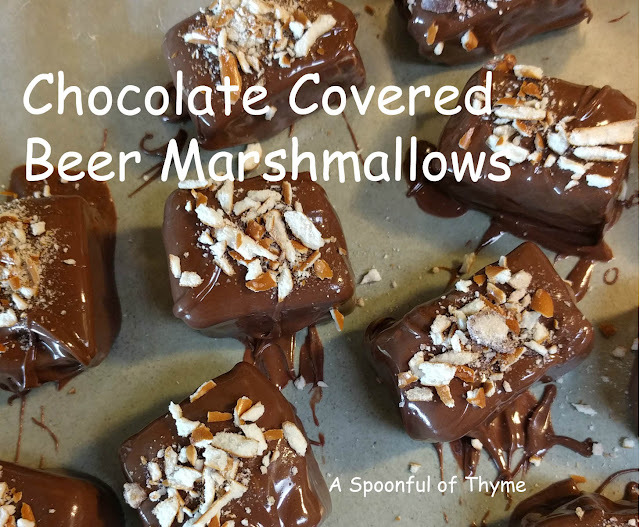 I cannot imagine how delicious these marshmallows must be, but I will know soon because I am making these. Thank you so much for this delicious recipe.